I was part of a group of six students and two teachers who had the opportunity to take part in a care and community project in Kathmandu, Nepal. We helped a local school by painting classrooms and teaching the children personal and dental hygiene. During the first couple of days the children were celebrating the festival Dashain at home so we had two days of hard work painting before we got to meet them all. During the next few days we painted different murals on the walls of three classrooms. The themes included: ‘under the sea’, ‘weather’ and ‘English quotes’. It was lovely to see the children running into the classrooms and trying to read all the words we had painted on the walls - it showed how it was going to really help their English. 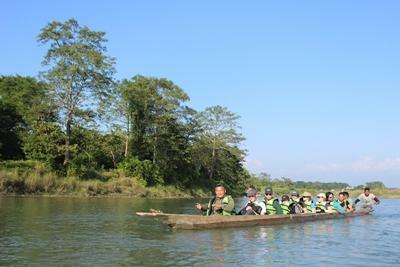 Over the weekend we all had a windy six hour journey round the mountains to Chitwan National Park. During our time here we went on a Safari where we saw rhinos, elephants, crocodiles, deer, monkeys and huge spiders! We also got to take a trip down a river in a canoe where we experienced the crocodiles up close and personal! As well as visiting Chitwan we were also lucky enough to visit a children's HIV clinic where we had a tour and were able to play with the children. I was expecting a clinical hospital setting and was really surprised at how warm and homely it was. Monday morning we were back at the school, but this week we had a couple of hours a day to do different activities with the children. These included: football, crafts, teaching parts of the body in English, creating a water rocket and singing English and Nepali songs. The children really enjoyed practicing all the English they knew when talking to us, and loved all the new songs we'd taught them. 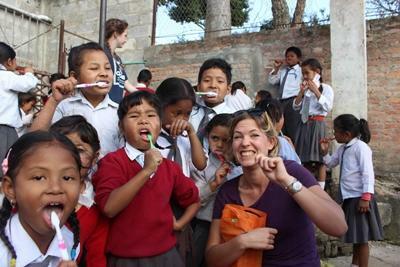 At the end of the week we taught the younger children about dental and personal hygiene. They loved learning a song to wash their hands to and receiving the toothpaste and toothbrushes we had collected from our college in England. When we left, the school all gathered to give us gifts and thank us. It was sad leaving the school and children behind but it reassures me that we had made a positive difference and left the school a brighter place for the children in the future.